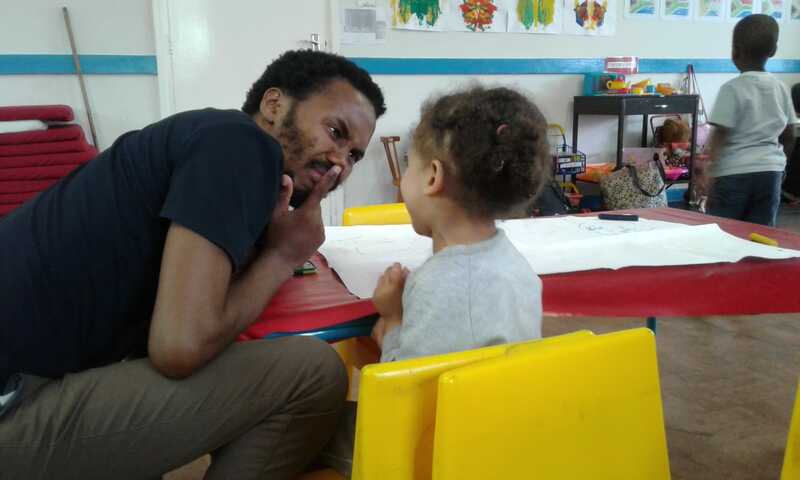 PRAESA Storyplay mentor, Sive Mbolekwa reflects on a session with the picturebook, If Big Can… I can by Beth Shoshan in an English medium preschool. The story uses a relationship between a big brown bear and a small koala bear to explore the theme of friendship. “We first showed the children story clues. These were a big and a small bear. We asked them questions that included, ‘do you know who these might be?’ When some said the big one was a mommy and the small a baby we asked them how they could tell. They said because mommies are with babies. But one boy challenged this saying the big bear was a daddy, the small one a baby because he drives with his dad to creche. We offer the clues for this purpose; to encourage thinking about the theme or one of the themes in the story before they have even heard the story. This can aid comprehension as we have started using the vocabulary and concepts in the story already – and concentration, as the children have begun connecting to it too. Nolu then shared the story If Big can . . . I can. with the class of three and four-year olds. After that the children were asked to choose to play in the various activities we prepared to extend the story. Some chose to play with blocks, some went to the reading corner, others went to play with playdough, some more chose to play with the natural material and small figures of animals in pairs of big and small, and the rest chose to draw. When they are tired of an activity they can choose another. The rest were on their second or third activity when I noticed one small girl, P who had been focused on her drawing the whole time. I went to see what she was busy with. As she was sitting by herself, I asked her if I could join and she said yes and continued her drawing. I asked her what it was that she was busy with. I had to ask this question in different ways to get her to speak. The teacher noticing this, mentioned that P is a reluctant speaker. When she answered she said she was drawing a frog and that it had arms and eyes. I also asked her what she does together with her frog. She said that they play in water and that her frog has hair like hers. I wrote down what she was telling me next her drawing, read it back to her and told her that I wrote down what she was telling me because it is interesting. I wrote it down because we also invite children to dictate for us and write their stories down in a story book. The children sometimes act these out later on the magic carpet. It is interesting that our approach makes provision for the adult to follow children’s interests. We show children that their interests are valid and are valued, ask them to elaborate and challenge them to think some more about their work and to share their thinking. This makes children, even the reluctant, want to talk and share their imaginings and stories as shown by the example of the quiet P. It also makes provision for their own meaning making because here P was also playing with the theme of relationships in her drawing. And this meaning making is important for comprehension because it allows the child to grapple with a concept or theme in her own way – a way that makes sense to her is through an activity she loves the best and has chosen herself. P clearly shows us the importance of this because she tells us she keeps a frog at home and that she plays with her frog. She is putting herself in a similar situation with the characters of the story, who also play together, by connecting her home experience and the feelings of warmth, security and belonging that home brings. She wants to think from this position. 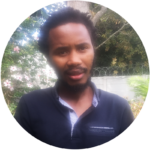 Sive Mbolekwa is a literacy trainer and Storyplay mentor. He enjoys thinking with young children and loves their sense of humour. He believes sharing stories and playing with children helps them learn better. Dragon mode – the story comes alive! Magic! Is anything possible in storyland?